Please share this with others, it’s such a wonderful show. Mycophilia is the first of two shows being presented in the Ceredigion Museum temporary gallery space by Short&Forward and runs from April 17 to May 31st 2014. Alice Forward’s exhibition Swarm Society will run from June 12th till 2nd August and her works resonate well with those of Louise. Both make work that explores our relationship with the natural world and expresses their passion for protecting and conserving it for future generations. They share a love of film, mushrooms, bees and life. 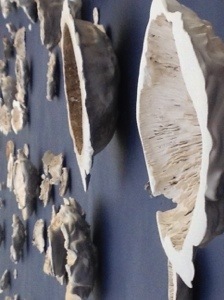 Louise Short’s exhibition, Mycophilia, exhibits exquisite casts of fungi and spore prints as filmic objects. 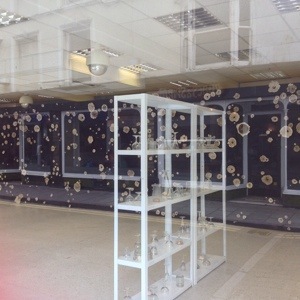 In a temporary space next to the Ceredigion Museum in Aberystwyth, she has presented a constellation of 3D snapshots of moments in time and place, captured and recorded in plaster, bronze, paper, paint and spore-dust on paper. 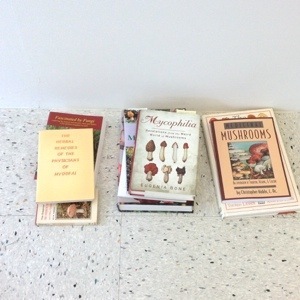 The title of the installation, Mycophilia, means the love of mushrooms, likewise filmophilia means a love of films. Spore-dust is an evocative phrase that whispers the story of their process in your ear. 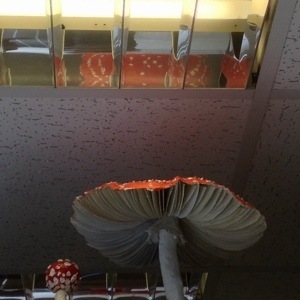 On entering the gallery to experience Mycophilia viewers are transported into another world. The prints on paper are trapped underneath glasses, lest they should escape like spiders or wasps, and the science-fiction presence of a constellation of plaster casts suspended in a deep blue universe spans the whole back wall. Ian Banks meets Richard Mabey meets Thoreaux. This installation is both 2D and 3D – filmic and sculptural. It hints at mass fields of growth and microscopic detail. Each trace of fungi reveals its own intricacy and uniqueness – together they are a cosmos. A love of the process of film and a deep understanding of nature is present in all of Louise’s artworks, but not always in an obvious, cinematic way. Mothshadowmovie (1999, 2000) turned an everyday office overhead projector into a screening device in a woodland – attracting and amplifying the ghostly visits of fluttering moths and slimy snails. For Something Else, her one person show at Arnolfini, Bristol in 1997, Louise cast the tender insides of daffodil trumpets, fixing the voids in plaster. In 2001, in the basement of what is now the Exchange Gallery in Penzance, she filmed the walls of the redundant telephone exchange then re-projected the 8mm footage back onto their surface. The projectors shuddered and rattled, returning life to the abandoned architecture. Feeling Faint created a gentle echo on the walls, the images quivered softly like Narcissus’s reflection on water. In Louise’s work solid things are made ephemeral and transient moments solid. Casting is like a 3D camera, the imprint of the brief moment that the fungus manifests itself above ground as solid matter is caught and made tangible. The spore-dust deposits fine footprints of the mushrooms reproductive potential, they multiply generously but few will survive the process. Their lives are brief, like stars they appear unexpectedly and disappear suddenly, as if by magic. They are indeed other-worldly without consumption – you don’t need to eat them to be enchanted and drawn in by their hallucinatory nature. In the scale of things humans are similarly short-lived. We make art, we write, we create, we procreate, and every moment is to be noted, considered and experienced in our short lifetime. This exhibition of fungi prompts us to be mindful of this and the artwork is the outcome of a very thoughtful and considered process of walking, meandering and being in the moment. During Louise’s regular forays through the beautiful Welsh landscape, where she lives and works, she was able to immerse herself in her thoughts of the ephemeral, returning with a record of her journey, on that day, of that place. I must let my senses wander as my thought, my eyes see without looking…Be not preoccupied with looking. Go not to the object; let it come to you…What I need is not to look at all, but a true sauntering of the eye. (Thoreau Journal 4:351) Solitude, silence, no signage, wandering aimlessly, like the rhizome of mycelia that appear as fairy-circles below the surface of meadow grass, Louise reflected upon her roots and relationships, walking random routes through the landscape, meandering, thinking and casting her gaze as she foraged, capturing her fragile trophies to keep. Fungi is corporeal in nature, soft like flesh, but cold to the touch. 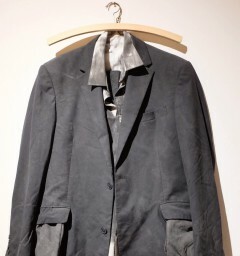 Love, tenderness, fragility, vulnerability, the human condition are all here in this exhibition. There are many exciting things happening every day and we all have things that inspire us and make us wonder about the world. Some take delight in sport results, others nature, others art, others technology. Some of us find the blurirng of the edges of those things the most rich area to explore. I certainly do. Those who have known me for some time will know that whilst I worked as an artist and now as a producer, the common thread throughout has been a slight penchant for technology. Both as a medium and an intellectual pursuit. No suprise then that I am excited by the upcoming publication of Technobiophilia by Sue Thomas. Nature and technology rubbing shoulders, creating new ways of understanding how we relate to the world. Sue has posted a video of her explaining a bit about the concepts behind the book and what motivated her to reserch the idea. It’s a fascinating way of thinking and slightly at odds with those who enjoy the power of the binary opposires of science V nature, nature V cyberspace. Technology is here to stay, get used to it. As Sue is also my sister – I am slightly biased. This is the first time we have worked together professionally (I did the black & white chapter headers, some shown in the video), so we’d love to hear what you think.